Home Cooking In Montana: Furikake... a roasted seaweed condiment. Furikake... a roasted seaweed condiment. Furikake... a roasted seaweed condiment. Some time ago, I purchased quite a bit of roasted seaweed... a Korean type of seaweed. Now, the Korean laver is quite a bit different than the Japanese nori... it's thinner, and quite fragile. I like it because it has a milder taste, and because it's seasoned, you can eat it on its own. You'll find the Korean seaweed has become quite popular as a snack, and while it was more difficult to find years ago, it's now readily available in most supermarkets. They're usually located in small packets near the Asian condiments. It's much cheaper for me to stock up on pantry items whenever I go visit family down south. I usually make it a point to stock up on items that I can't find here in Montana(though more and more items are now available here as well).... this normally means more of the Asian condiments. You can find bulk items in most Asian stores, so it's much cheaper buying in bulk. In any case, one day I was looking in my pantry and noticed I had quite a bit of the roasted seaweed. The expiration date was quickly approaching, so I knew I needed to use it soon. I had seen different Japanese condiments at my local natural food store... from gomasio to furikake to togarashi. But they were always a bit expensive. I immediately thought of making my one version of the Japanese style seasoning. Furikake is a Japanese condiment that uses traditional Japanese nori, but I used my Korean laver to make my own version of "furikake". Of course, you can use the traditional nori sheets, but you will need to add some salt to the mix. I made my first "furikake "batch a year or so ago... and LOVED it! Been making it ever since. So when I was mixing a batch of my seaweed condiment recently, I thought to share it. Maybe some of you might be interested in trying it.... especially if you enjoy eating the seaweed as a snack. 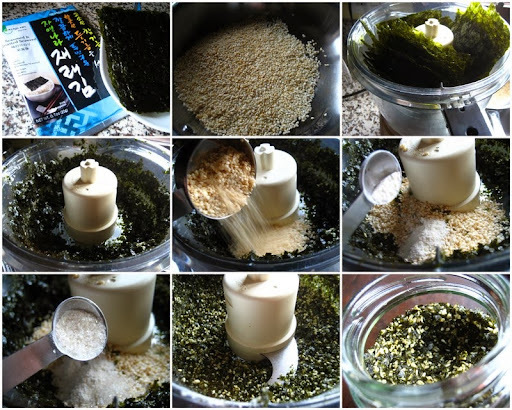 Furikake seasoning can vary... you can add all sorts of ingredients to the basic seaweed, sesame, sugar and salt mix. I LOVE the flavor of dried onion powder, but you can use other ingredients of choice. I've listed some options below. Even the basic mix is flavorful on its own. And you can adjust amounts to suit your own taste. Tip: Now, these measurements are just a guide, you can easily use more or less of each ingredient... it really doesn't have to be exact. *you can use Japanese nori(for sushi rolls), but you will probably need to add some salt. 1. If using raw sesame seeds: Heat skillet on medium heat, add sesame seeds and toast till golden and fragrant stir often so as not to burn... a couple of minutes or so. Remove seeds and set aside to cool. 2. Cut seaweed in pieces and place in a bowl of a food processor. Add the sesame seeds, onion powder, and sugar.... and any other optional ingredients you desire. 3. Process until seaweed is the size of rice and everything is fully combined. 4. Store in a sealed container... in the refrigerator or freezer. I am a long-time subscriber and enjoy your posts very much. I'm a big fan of gamasio and use it to top many things(rice, quinoa, potatoes, salads), but have never seen furikake in any of my stores. I could easily make it from things in my pantry, but would love to see some suggestions for usage. Kristyreal, Oh, that means a ton! Thanks for being a reader! Hope these extra suggestions help... on top of the others I mentioned in my intro. Thanks a ton for stopping by. Really appreciate it!